Dee Cover, fourth from left, is the new president of the Assistance League of the Bay Area. Other new officers joining her here for a photo are, from left, Secretary Cathy Wolfe, Vice Presidents Ellen Lancaster and Katy Bastedo and President-elect Ann-Marie Doolin. The treasurer, Barbara Weitenhagen, was absent. DEE COVER, the new president of the Assistance League of the Bay Area, was installed, along with President-elect Ann-Marie Doolin, when the philanthropic organization held its annual meeting in South Shore Harbour Resort’s Marina Plaza Ballroom. Others who’ll serve with them include Vice Presidents Katy Bastedo, Cathy Miller-Thornton, Carol Latimer and Ellen Lancaster; Secretary Cathy Wolfe, Treasurer Barbara Weitenhagen, plus Assisteens Coordinator Karen Douglas, Education Chairman Arlis Miles, Marketing Chairman Lisa Holbrook and Strategic Planning Chairman Ann Hammond. Clear Lake Area Panhellenic’s officers for the coming year are installed at the May luncheon. 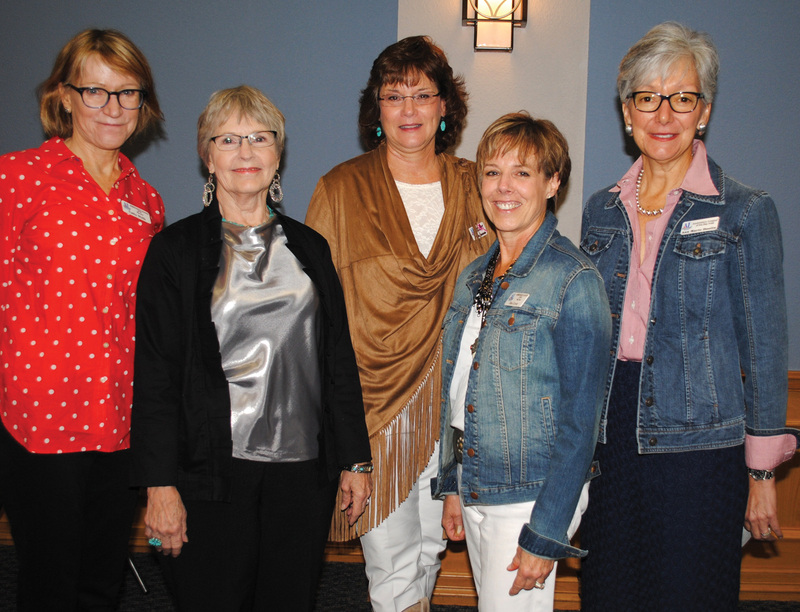 Among them are, from right, President Jill Reason, First Vice President Michelle Richardson, Second Vice President Kathryn Vernau and Third Vice President D’Lisa Johnston. 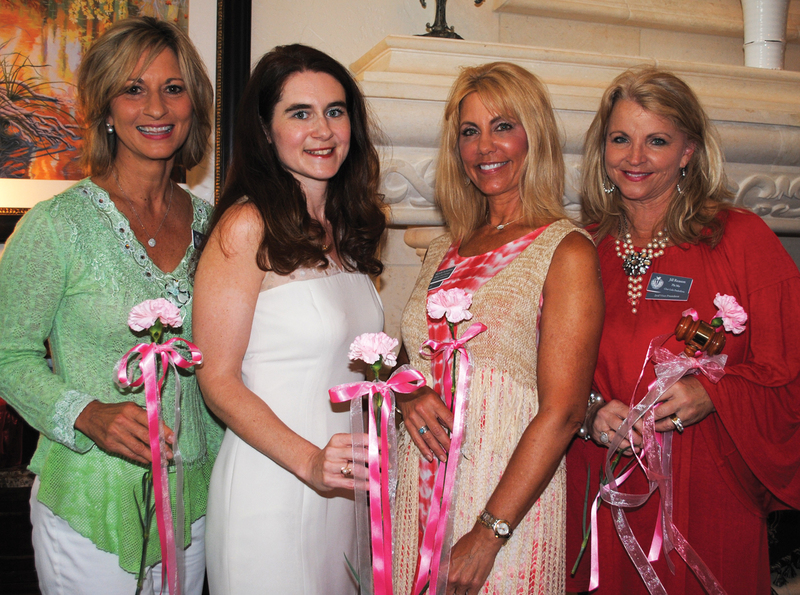 HOSTESS Barbara Dickey’s lovely Bay Oaks home was full to overflowing for Clear Lake Area Panhellenic’s May installation luncheon, featuring the introduction of Jill Reason as the sorority alumnae organization’s new president. Others installed to serve with her were First Vice President Michelle Richardson, Second Vice President – Scholarship Kathryn Vernau, Third Vice President – Philanthropy D’Lisa Johnston, Secretary Sheryl Williams, Treasurer Lisa O’Brien and Corporation Secretary Becky Hensley. Another highlight of the luncheon came when Jo Nell Hunter and Michelle Richardson were each presented with Citation Awards for their contributions to both Panhellenic and the community. Mary Voigt, second from left, is the new president of the Houston Symphony League Bay Area. Among those who will be assisting her in the coming year are, from left, Nominations Chairman Dana Puddy, Corresponding Secretary Alice Steele and Recording Secretary Jane Lackow. HOUSTON SYMPHONY League Bay Area members have chosen Mary Voigt to lead them in the coming year. She was installed, along with the other officers, at the league’s annual May installation luncheon in the Lakewood Yacht Club ballroom. She’ll have no shortage of help with six vice presidents lending a hand — Vickie Buxton, development; Nina McGlashan, education; Karen Akkerman, membership; Carol Wilson, programs; Patience Myers, finance; and Jim Moore, communications. Other elected officers include Corresponding Secretary Alice Steele, Recording Secretary Jane Lackow and Nominations Chairman Dana Puddy. ALPHA CHI OMEGA alumnae have elected their officers for the coming year, choosing Monica Gibbs to serve another term as president of the local Iota Psi Iota chapter. 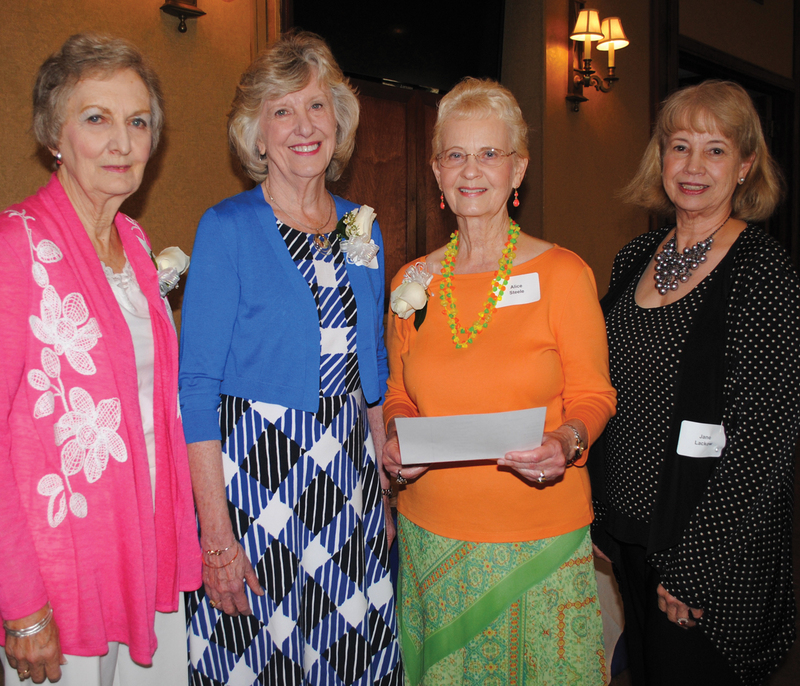 Her installation came during their spring luncheon at South Shore Harbour Resort. Serving with her will be Vice President Michelle Richardson, Treasurer Janel Salmen and Secretaries Brandie Soenning and Carolyn Waidhofer. BAY AREA Museum Guild President Brandie Corrao has been reelected to serve another term. Joining her in heading the organization for the coming year are Missy Rorrer and Susan Barton, who will serve as first vice presidents – programs and Second Vice President – Membership Justine Powell. Others who’ll assist Brandie next year are Treasurer Diana Dornak, Secretary Gayle Nelson, Corresponding Secretary Jill Williams and Parliamentarian Carole Murphy. They plan another full schedule of events starting with the museum shower in September, and including Just A Pretty Table in October, the Toyland Fantasy Breakfast in December, the Silver Tea in May, plus Music at the Museum and Picnic at the Museum. They were installed during the guild’s installation luncheon at the South Shore Grill. 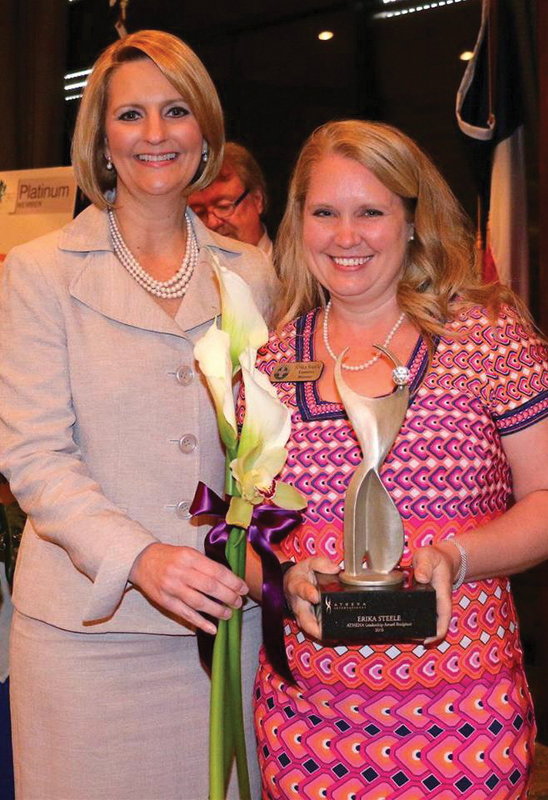 Erika Steele, right, is presented the 2016 Athena Leadership Award by Jill Kaiser, chairman of the League City Regional Chamber Board of Directors. ERIKA STEELE is the recipient of the 2016 Athena Leadership Award — inspired by the Greek goddess Athena, known for her strength, courage, wisdom and enlightenment –- and presented by the League City Regional Chamber. Jill Kaiser, chairman of the Chamber Board of Directors, made the presentation. This year’s winner, a Purdue University alumna, gave up her original plans and changed careers from being an engineer to become executive director of Lighthouse Christian Ministries. In her post at the non-profit, she has used her technical and organizational skills to implement, build and improve programs for economically challenged and disadvantaged persons in the Bacliff area and beyond. Friends say she is a true collaborator and a seeker of partners in her quest to help those less fortunate in Galveston County. She does so to bring more resources to those the non-profit serves. She is currently active in several civic organizations such as the League City Regional Chamber, Clear Lake Area Chamber, Clear Creek Community Church, League City Rotary Club and is currently a class member of League City Leadership Program and several others. It is her responsibility to oversee programs in which young women can earn their high school diploma through a GED program, as well as earn scholarships to community colleges. It is her desire to equip women with the leadership skills and tools to move them out of poverty to self-sufficiency and then on to a level of giving back.